In a world where reality is rapidly dissolving and the universe is coming apart, what’s an advanced post-biological lifeform to do? In Atomega, these lifeforms compete in arenas to gain mass, either by collecting it peacefully or blasting their opponents apart. The more mass you gain, the more your lifeform will evolve along a diverse spectrum from nimble Atom to godlike Omega. 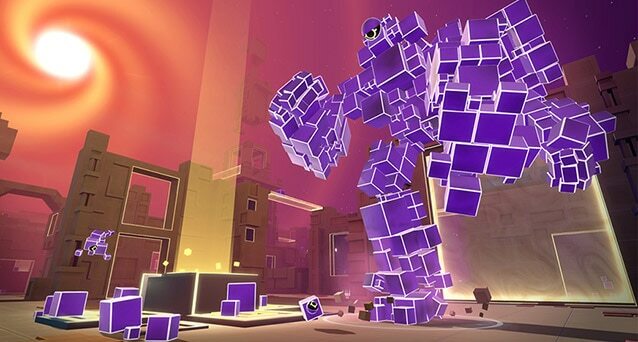 Mass is the key to victory in Atomega, a new online first-person shooter from the team at Reflections, the Ubisoft studio that created Grow Home and Grow Up. Up to eight players can duke it out in 10-minute rounds, gathering mass, losing it, and building it up again over the course of the skirmish. In addition to earning you points which determine the ultimate winner of the round, gaining mass will allow you to change up your strategy on the fly. The dynamic competitive action will be suffused with the lighthearted tone characteristic of the Reflections team. Atomega is scheduled for release on PC on September 19, 2017.